Announcing a new add-on feature to the blog - A Downloads Gallery! 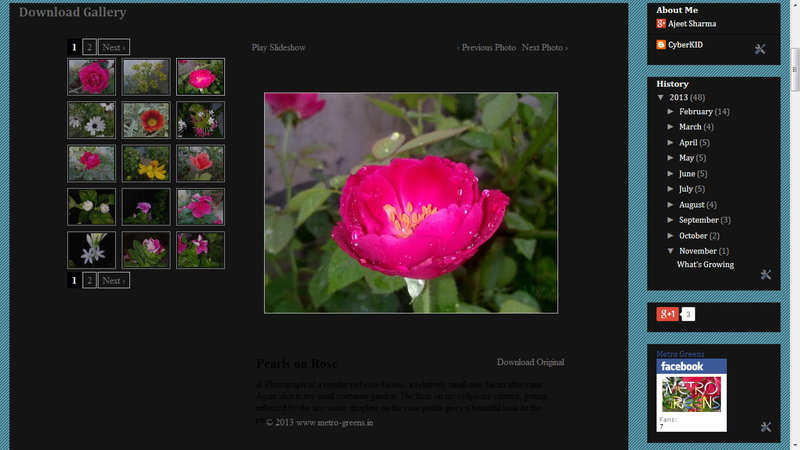 This page lists images that I capture, of my plants and flowers at my rooftop container garden. You can download and use these as wallpapers on your desktop or phones. To make the use easy, we are offering images with a standard size of 2592 x 1944, (5 mp) that can easily be used to print an A4 sized photo. Please do note that any of the images (otherwise indicated) haven't been "enhanced" and are as they were captured with my cellphone, except for the addition of watermark. For downloading the images as wallpaper, we have provided a direct link to download the full resolution image (i.e. 2592 x 1944), that makes use of the HTML 5 download attribute of the href. Since this feature is currently supported in Google Chrome, it will work best in Google Chrome browser. For downloading the images as wallpapers in other browsers, one can right click on the link (Download Original) and use Save Image As from the context menu. The menu bar, as you might now be quite aware of, now, has a working Downloads menu item, that takes you to the download gallery. Screenshot of the downloads page, showcasing some of the items available for download. Coming up next will be a post on my broad beans vine that has started blooming. Do post your comments on the photograph downloads available in the downloads gallery. I will keep it updating as and when I capture shots of new blooms. I will be back with some more posts in the upcoming posts. Till then, keep visiting, happy downloading, and HAPPY GARDENING!